Kimberly Inez McGuire is an award-winning communications strategist, queer Latina reproductive justice advocate, and lifelong policy wonk with more than a decade of experience creating and implementing winning strategies to reshape the public narrative and policy landscape. As Executive Director of URGE: Unite for Reproductive & Gender Equity, Kimberly leads the organization in building a world where all people have agency over their own bodies and relationships, and the power, knowledge, and tools to exercise that agency. Kimberly brings to her work with URGE comprehensive, intersectional experience with youth leadership, wins in federal and state policy and campaigns, and deep roots in reproductive justice organizing. 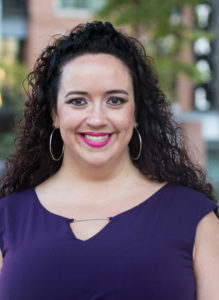 Previously, Kimberly served as a Senior Program Director with ConwayStrategic and Director of Public Affairs for the National Latina Institute for Reproductive Health (NLIRH). Kimberly is also an URGE success story – her journey in reproductive justice began with an URGE internship as a college student. Kimberly participated in the 2017 cohort of the Rockwood Leadership Institute Reproductive Health, Rights, & Justice Fellowship. Currently, she serves on the Board of Directors for the Sexuality Information and Education Council of the United States (SIECUS). A prominent spokesperson on reproductive justice and public policy, Kimberly has been featured in: Washington Post, NBC Latino, Fox News Latino, Color Lines, ThinkProgress, and other outlets.